"Carnival of the Animals" is one of Camille Saint-Saens' most popular works and it is a suite of 14 movements originally scored for just 11 players. 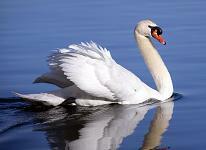 "The Swan" is one of the best known movements from the suite. It is sometimes played on its own as a solo work, and has also been used as a ballet piece. Although other arrangements are available, the music included here for The Swan is the original version which is for solo cello accompanied by two pianos. The cello plays a gentle lyrical melody as though a swan is gliding gracefully, while the pianos seem to suggest some gently rippling water. The score and individual parts can be downloaded using the links in the left-hand menu, as can Midi & MP3 versions of the same piece. Below is a video showing a piano roll animation of the music, and further down you can play the mp3 file and see the sheet music score before downloading. Since it can be difficult to get 2 pianos and pianists together, we also have a version of The Swan with a single piano with a range of options for the solo instrument including Cello, Viola, Violin, Carinet, Cor Anglais or Bassoon. The full work of 14 pieces in the original arrangement for 11 instruments is available from at these links from Sheet Music Plus (US) or The Music Room (UK).